On 20 July 2017, Afrobarometer Executive Director E. Gyimah-Boadi received the 2017 Martin Luther King, Jr. Award for Peace and Social Justice in recognition of his role in advancing democracy, good governance, and economic opportunity in Ghana and throughout the continent. Here are U.S. Ambassador to Ghana Robert P. Jackson's remarks in presenting the award. My wife, Babs, and I welcome you to the Tenth Annual Martin Luther King, Jr. Award Ceremony and Breakfast. For a decade now, we have gathered annually to recognize a Ghanaian citizen who personifies Dr. King’s philosophy and actions. Someone whose life’s work has contributed greatly to society — here in Ghana, or sometimes even well beyond the borders of this country. That is true today as we honor Professor Emmanuel Gyimah-Boadi. The tradition of awarding the Martin Luther King, Jr. Award for Peace and Social Justice was started by former Ambassador Pamela Bridgewater. The award has, through the years, recognized a number of outstanding individuals, many of whom are here today. We are honored by your presence and continually inspired by your work. As we honor the individual, we also honor the memory of Martin Luther King, Jr. We remember the sacrifices he made as he spent a lifetime advocating for social justice, human rights, and equality through nonviolent means. The 1950s and 1960s were turbulent times in America. The civil rights movement swept the country and, through the advocacy and activism of ordinary people, the United States emerged as a better country. We still have work to do. We still need advocates and activists who work tirelessly to create an equal society for all Americans. We are not there yet. But we are far closer than we would be without Dr. King. Dr. King fought for equal rights through nonviolent protests and through constructive dialogue. His message and his methods remain relevant throughout the world today. He understood that change happens when people are informed — when they become convinced that the status quo is simply not good enough, and that they deserve better. This year, it gives me great pleasure to present the Martin Luther King, Jr. Award for Peace and Social Justice to Professor Emmanuel Gyimah-Boadi. As the Executive Director of both the Ghana Center for Democratic Development (CDD) and the Afrobarometer, Professor Gyimah-Boadi has set a lofty standard for scholarly research among the think tank community in Ghana, and across Africa. His work has helped promote democracy, good governance, and economic opportunity. He has championed human rights for marginalized and vulnerable populations. In doing so, he has served as an advocate for millions of people, giving them greater access to essential services and a greater voice in how they are governed. I read a recent interview with Professor Gyimah-Boadi in which he expressed his belief that democracy will continue to thrive in Ghana; that it will buttress democracy throughout the continent; and that a young generation of Africans, empowered by education, social media and new technologies — empowered by information — will claim their right to be heard. I believe in that vision of the future, too — in no small part because I see him doing everything in his power to make it so. The CDD, under Professor Gyimah-Boadi’s leadership, has contributed to shaping positive political outcomes across the continent. Last year, the Center again played a tremendous role in Ghana’s credible elections and peaceful transfer of power. Together with CODEO — which was established under the auspices of CDD — the Center worked tirelessly to promote electoral reform and ensure campaigns and candidates addressed real issues, particularly those affecting women, youth, people with disabilities, and people living with HIV and AIDS. 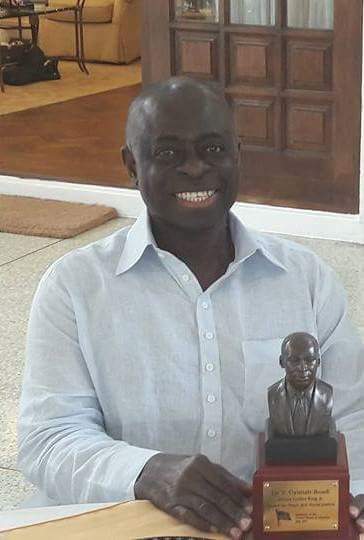 Professor Gyimah-Boadi’s leadership ensured that Ghanaians had information about their election and that their right to freely choose their leaders was protected. That work continues post-election. The Center’s “I Am Aware” campaign provides information on services provided in districts and constituencies around Ghana so that citizens can hold government accountable. It’s information that gives people power to stand up for their rights. And if we’re going to talk about the importance of information, what greater source do we have about the wants and needs of African citizens than Afrobarometer? The research conducted by Professor Gyimah-Boadi and his colleagues has given the ordinary man or woman on the street a voice — an opportunity to express their opinions on the issues that affect their daily lives: health, corruption, access to justice, education, and more. This treasure trove of rich and comprehensive data from dozens of countries sparks dialogue among governments, civil society organizations, journalists, investors, regular citizens — anyone who feels their stake in the future of Africa. In fact, just this past month, Afrobarometer’s research was at the center of a policy brief presented to the G20 on how G20-Africa cooperation can better align with the priorities of everyday Africans. Professor Gyimah-Boadi understands that when the will of people is known, they can be included in policy decisions. When citizens can compare the progress their government is making with other governments across the continent, they can challenge the status quo. They can demand better services. They can demand transparency and accountability. And when citizens are satisfied that their government is responsive and accountable, peace and stability follow. These are not easy issues to tackle, in any country. But Professor Gyimah-Boadi has dedicated his life to doing just that, in multiple countries — and democracy, social justice and equality across the continent are stronger because of it. Professor Gyimah-Boadi is one of those rare men. I think Dr. King would respect the way he has asked hard questions and discerned the truth. I think he would be pleased with his tireless efforts to inform the people, so they can stand up for their rights and demand good governance and accountability. I think Dr. King would respect the way he has constructively challenged governments, civil society, citizens, and all of us to think about the future of Africa, the future of democracy, and our responsibility to ensure peace, justice and equality for all. It is now my honor to call on Professor Gyimah-Boadi to receive the 2017 Martin Luther King, Jr. Award for Peace and Social Justice.